Australia has been a world leader in water law and governance reform. However, after 20 years of progress, water is quickly slipping from the national agenda. Despite many remaining implementation challenges and drought risks, there has been little detailed intergovernmental direction about the “next steps” in Australia’s water strategy. 1. How far has Australia come with the National Water Initiative? What has it achieved and what barriers did it face? 2. Is the current governance system a sufficient model capable of broader application to meet future water challenges and a sustainable future? 3. What fundamental reforms and changes might be required and what other credible water governance and policy alternatives might be available? developing northern Australia (eg infrastructure, strategic planning and engagement of Indigenous peoples). 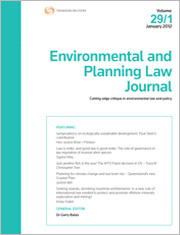 Click here for further information about the Environmental and Planning Law Journal or here to obtain a copy of this Special Issue. You can also purchase journal articles by completing the Individual Article Sale order form and emailing it to tlranz.journal.orders@thomsonreuters.com.